Several hundred firefighters, emergency medical technicians and their supervisors gathered at the Atlanta Marriott Buckhead Hotel & Conference Center for the annual “Breakfast With Our Bravest” on Friday, November 18th. 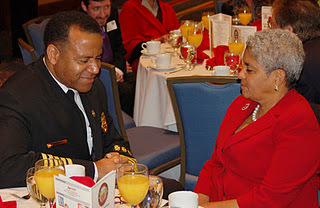 Atlanta firefighters and organizations were among the recipients of the scores of awards presented during the breakfast put on each year by the Atlanta Fire Rescue Department and Atlanta Fire Foundation, Inc.
Atlanta Fire Rescue Department and Atlanta Fire Foundation, Inc.
Mayor Kasim Reed, WXIA-TV’s Ted Hall, Fire Chief Kelvin J. Cochran and former Mayor Shirley Franklin, Honorary Chair, were among some of the speakers at the event. Black Bear Design Group participated in it’s second year designing and printing the brochures for the event. “We are very honored to have the opportunity to participate again in this special event. These men and women are superheroes and it is such a great feeling that we can give something back to the community”, states CEO, Randee Black. Public and Media Relations, Karen Canavan PR, promoted the event and helped write the script which Ted Hall emceed.